Buick's full sized luxury car will see improvements throughtout, but is not a dramatic redesign. 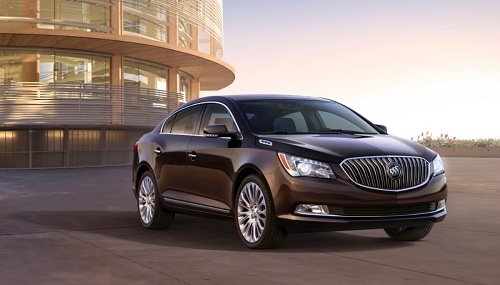 The Buick LaCrosse will be new in 2014 and today General Motors revealed the new vehicle. Will the LaCrosse have what it takes to compete in this difficult segment? It looks like it will. The segment that LaCrosse is in is the full size, near luxury segment. Buick would say that it is actually in the luxury segment, but would then sort of explain that the Cadillac offering of that size is actually more of a luxury model. Confusing? Maybe, but the success of the LaCrosse so far is not in question. Last year the LaCrosse was responsible for about a third of overall Buick sales with deliveries of 57,076 units. In 2013 the rate has declined, with February being down 30% over last year. However, inventory management by GM may be part of that. With the new car coming it may have slowed production a bit to avoid embarrassing model year overlap at dealerships. The full sized Toyota Avalon and the Lexus ES350 compete with the LaCrosse. Interestingly, the Lexus sold almost exactly the same number of ES350s as the LaCrosse last year. Both the LaCrosse and the Lexus are new this year. It will be interesting to see how the matchup progresses. The Avalon has jumped up in sales to meet the volume of these two since its new restyling, despite reviews that claim customers were unimpressed. The exterior of the 2014 LaCrosse is new and is defined by wing-shaped LED lighting. In back the rear lights wrap around the corners of the car. 20 inch painted chrome style wheels are now available. The overall exterior look is not dramatically different. That is typical for the segment. Big changes are not always welcome changes. Drivetrains including the eAssist four cylinder and more appropriate to the class, six cylinder engines are unchanged. The 2014 Buick LaCrosse will be on sale this summer.